A rainbow of heirloom tomatoes from Dave’s Natural Garden. We also were excited to see students and professors from Mount Holyoke College return for classes. They are some of our favorite market customers and we love to see South Hadley bustling again when school is in session. Although we miss our steadfast market kids who came every week during the summer for face painting and crafts, and we hope they are enjoying their school year! 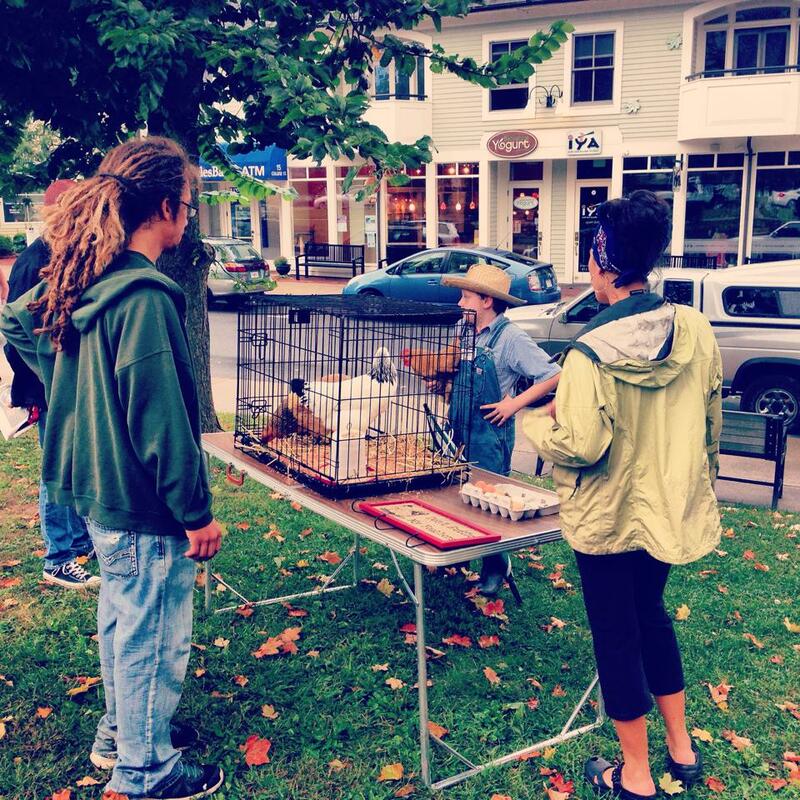 We also had some truly wonderful entertainment from old friends Eva Cappelli, Jay Mankita, and Cameron Sutphin, and we also learned a thing or two about backyard chicken farming from a South Hadley resident who brought his hens to the market. 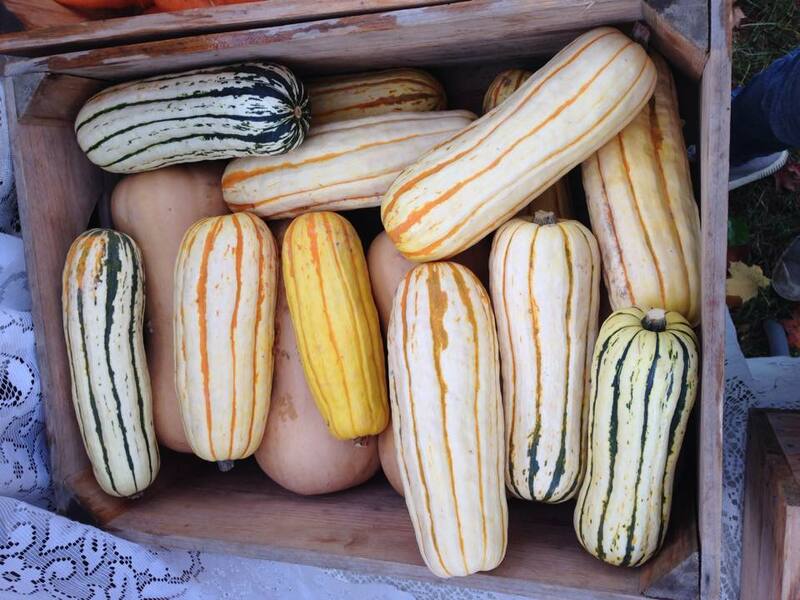 Delicata squash – slice in it half, scoop out the seeds, drizzle with olive oil, salt, and pepper, and bake for 45 minutes at 375 degrees F. Stuff with rice, beans, tomatoes, and onions, and serve! 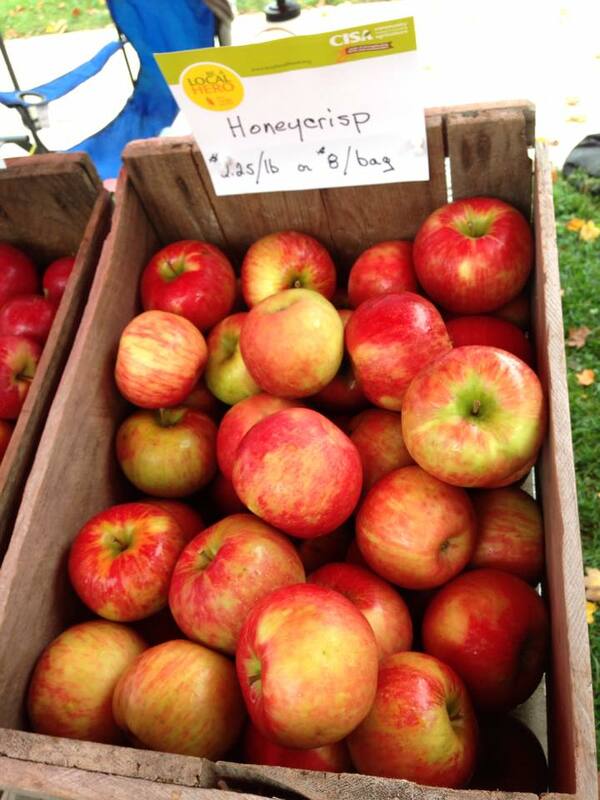 Honeycrisp apples from Sentinel Farm. We’ve been lucky to see so many delicious varieties at the market this year, including Macintosh, Crimsoncrisp, Empire, Fuji, Silken, Jonagold, and more. 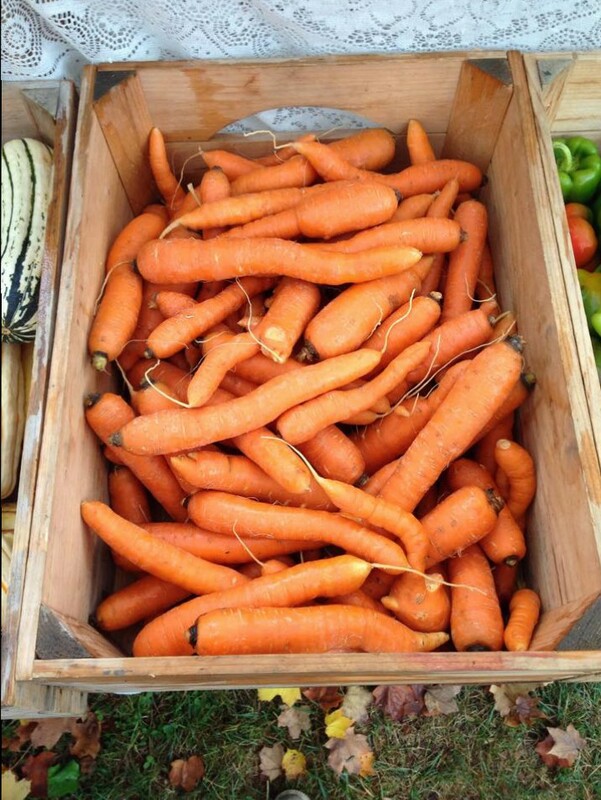 Sweet fall carrots from Farmacy Gardens. Our veggie farmers collected the silliest looking produce from the harvest, and we set up a display at the Healthy Community table. 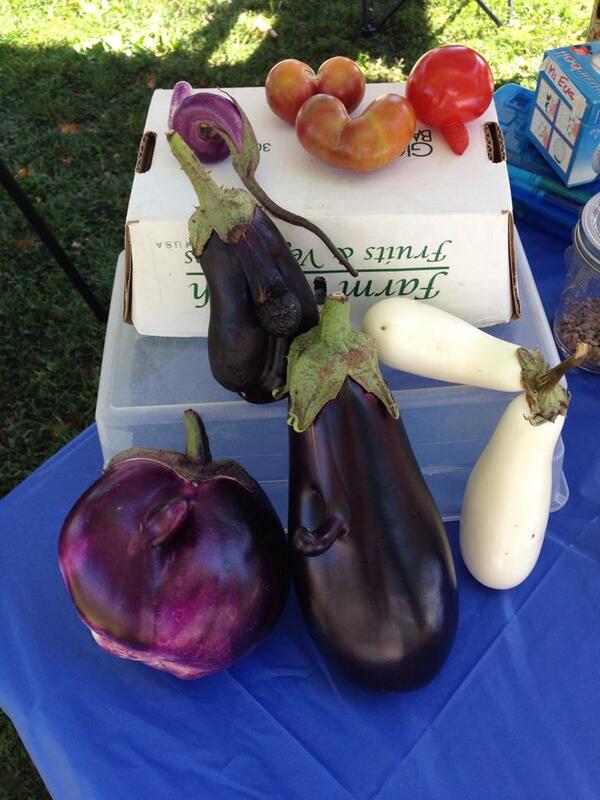 I spy three eggplants with curly noses, a double white eggplant, an extra curly Japanese eggplant, and a tomato with a nose, too! Backyard chicken farmer and South Hadley resident Liam taught us about and let us meet his hens at the farmers’ market. We’ll see you at this week’s market — 1:00 pm on the town common. Don’t forget that you can stock up on many things for the winter! Grab squash, onions, and potatoes for storage, buy some apples or grapes to make homemade applesauce or jam, pick up some frozen beef, or buy a few loaves of artisan bread to slice and freeze. There are lots of ways to enjoy the market’s bounty even into the winter. Come by and celebrate another great season with us! Leave a comment Thanks for a great season!